880 The very small size of the boron nitride grains in the mixture make this grade particularly resistant to wear, and thus suitable for finishing operations on gray iron. 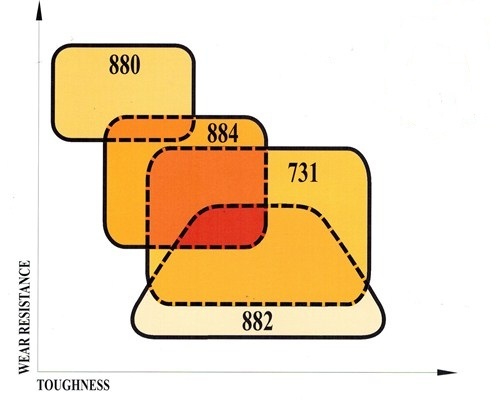 884 The excellent tradeoff between boron nitride grain size and the proprieties of the binder results in a CBN grade with good wear resistance and toughness. 882 The size of the boron nitride grains and the powder concentration, or in other words the density of boron nitride in the mix, make this grade suitable for finish machining hardened steels and making it possible to machine hardened steels under interrupted cutting conditions. 731 Solid CBN for machining hardened cast irons. FIUDI turning inserts are available in four different profiles, “E/L/M/H”, all with standard dimensions. Customization is a must when CBN is used as a cutting material.